Swedish fashion giant H&M has been accused of ripping off Australian musician Harvey Sutherland in a recent advertisement. 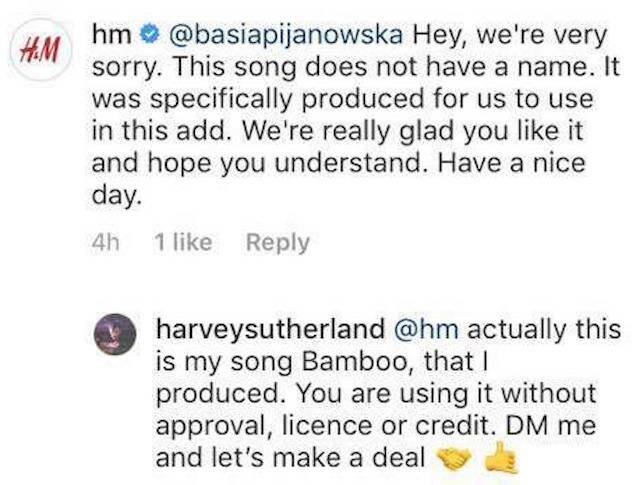 The Melbourne producer took to socials today to accuse the company of using his song ‘Bamboo’ in their new video for H&M Magazine’s feature on blue jeans, without his approval. The screenshots also show the official H&M Instagram account commenting that the song used in the clip was “specifically produced for us to use in this add [sic]”. Sutherland can be seen telling H&M to message him so they can “make a deal”. You can watch the blue jeans ad above [UPDATE: The ad has since been removed. Details below. ], and then compare it to Harvey Sutherland’s ‘Bamboo’ down below. TheFashionSpot has contacted H&M for comment. This isn’t the first time H&M has caused controversy with a musician this year. Back in January, Canadian singer The Weeknd parted ways with the company over a “deeply offensive” advertisement featuring a black child model.